Area 51, Hangar 18, the Montauk facility, the Dulce Base, the undersea world of Sanya, HAARP in Alaska, Pine Gap, Fort Detrick, Rudloe Manor, and the Zhitkur underground realm. These are just a few of the select, highly classified installations about which the governments of the United States, Australia, China, Russia, the United Kingdom, and others prefer that we, the general public, remain steadfastly ignorant. And those same governments have excellent reasons for wishing us to remain in the dark. It is at these secret facilities that for decades clandestine research has reportedly been undertaken into crashed UFOs, deceased alien entities, bizarre creatures and unknown animals, lethal viruses, biological warfare, mind-control experimentation, and much, much more. 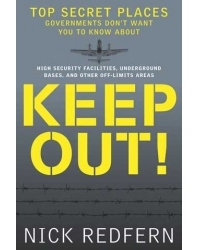 Whether situated deep under the oceans, far below the ground, or within the heart of remote, fortified desert locales, these and many other supersecret places are guarded with a near-paranoid zeal by those in power who wish to keep their secrets buried and locked far away from prying eyes. And they have succeeded. Until now. Nick Redfern works full-time as an author, lecturer, and journalist. He writes about a wide range of subjects, including Bigfoot, UFOs, and paranormal phenomena. Redfern is a regular contributor to UFO Magazine, Fate,and Fortean Times. He has appeared on many television shows, including the History Channel’s Monster Quest; the National Geographic Channel’s Paranatural; and the SyFy Channel’s Proof Positive. His previous books include The NASA Conspiracies, Contactees, and The Real Men in Black. Redfern lives in Arlington, Texas, and can be contacted at his Website.